Would you like to get your golf balls backspinning after they land on the green…just like professional golfers do? Well, as you read this article you’re going to learn how to do that. First a cautionary point. If you’re not getting your pitch shots up to the hole now then learning how to get backspin on your shots is not going to be much good, is it? So I’m going to assume you get your pitch shots up to the hole and you want to learn how to spin them so the ball stops next to the hole. One of the first things you need in order to spin your pitch shots is wedges with new, fresh grooves. If you’re using old clubs with worn out grooves then it’s going to be next to impossible to spin your pitch shots, no matter what you do. So you need pitching clubs with clean, sharp grooves. 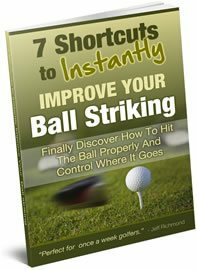 The next important element needed to spin pitch shots like a pro is the right type of golf ball. If you use a softer golf ball rather than a harder golf ball then that will make it much easier to spin your pitch shots. Sure, you may lose a bit of distance – but you’ll make up for it with your increased control around the greens. Now let’s look at the pitching swing itself. One of the most important aspects needed in your pitching swing is to contact the ball first with a descending blow. You need to contact the ball first and then make a nice sized divot afterwards. So getting a clean, crisp contact with the golf ball first is critical if you want to backspin your pitch shots. Having said that, it’s a lot easier to get backspin when the ball is lying on very short grass than if it’s lying in the rough, because there is no grass to get between the clubface and the golf ball. The only trick with a shot from a close lie is that you must hit the ball first. There is no margin for error. Ok, let’s sum up what you need to get backspin on your golfing pitch shots. First you need to make sure you’re using golf clubs with fresh, sharp grooves. Then you need a ball conducive to getting backspin, i.e. a softer ball. 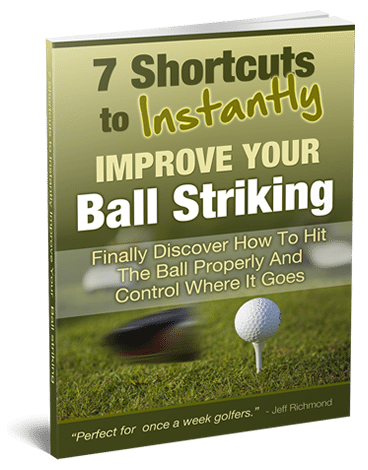 You need to swing down sharply into the ball and make sure you contact the ball first. If you can do all of those things and you have a clean lie and a receptive green then you will see your pitch shots having backspin on them. Have fun!